Members of the community, municipality, Washington Township Municipal Alliance and recovering addicts are pictured on the donated Remembrance Bench at the vigil. In the past two years, Kennedy University Hospital in Washington Township has administered more than 3,000 shots of Narcan to patients experiencing a drug overdose, averaging one dose of Narcan every five hours, according to emergency department doctor Jim Baird. With the purpose of breaking the stigma of addiction, raising awareness and remembering those lost from drug abuse, Baird and many others shared their stories at the first Addiction Awareness and Remembrance Vigil last week at Washington Township High School. Washington Township native Lindsay Parker began experimenting with drugs when she was 16 years old. What started as an addiction to Percocet, turned into oxycodone, which led to methadone and eventually heroin, a drug that also took the life of her brother Shane. Parker found herself in a beachside community rehab, which led to an Oxford House on the shore. Unfortunately, she said, programs such as these do not exist in Washington Township, and maybe if they did, her story and the story of others would have different endings. Parker found out she was pregnant with her daughter while in a full-fledged addiction to heroin. While her daughter was in the NICU, Parker was arrested for possession in Atlantic City, she said. While Parker tried to find a local hospital or facility to detox, she was forced into a psych ward where she felt “spiritually, mentally and physically beaten.” It was then Parker surrendered and was willing to regain her sobriety. She reconnected with her network on the shore, called her sponsor and began the program she lives by to this day. Parker recently celebrated one year of sobriety. Hurffville Elementary Students performed an original song, written and arranged by teacher Eileen Lucarini, highlighting community service and caring. The event aimed to raise awareness for addiction and shed light on the fact addiction has no boundaries, it does not discriminate and there is help available. Members of the Washington Township Municipal Alliance and administration presented a remembrance bench, donated to honor and remember those in the community who have been lost to addiction. The bench will be located in the Washington Lake Park. Students of Hurffville Elementary School, under the advisement of music teacher Nancy Leong, performed an original song, written and arranged by teacher Eileen Lucarini, “It’s Up to You, It’s Up to Me,” highlighting the importance of service and community. Additional music pieces were sung by members of the Washington Township High School Choir, along with Gloucester County Institute of Technology student Amanda Peacock. A variety of resource tables were available for attendees to browse and learn about the programs and facilities available for families and community members. At the end of the evening, a candlelight vigil was held with lanterns created by students on the annual Senior Service Day to remember community members who have passed. 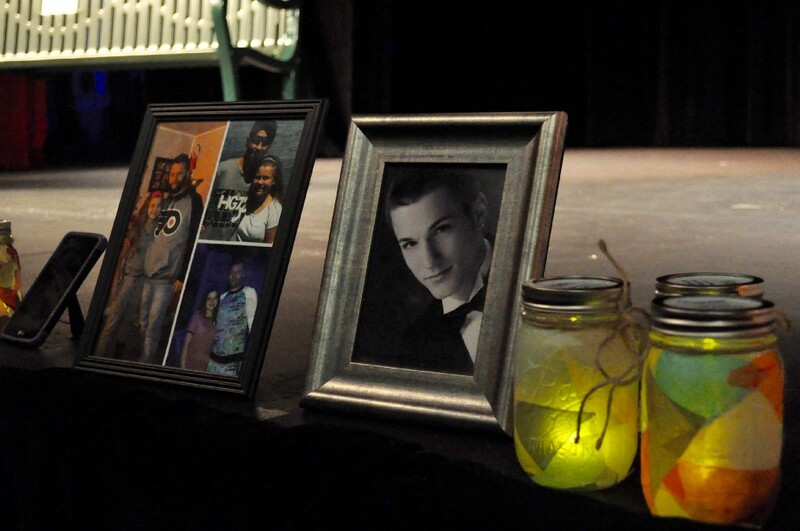 Participants were able to provide a photograph of their loved one, placed on the stage for all to pay their respects. Resident Harry Smith placed a photograph of his son Dylan at the front of the auditorium during the candlelight vigil, having celebrated what would have been his 26th birthday a few days prior. According to Prosecutor Sean Dalton, approximately 80 people are lost to opiate addiction each year in Gloucester County. Police Chief Patrick Gurcsik said when he began his career 25 years ago, a call for an unconscious person in a motor vehicle was often assumed to be a drunk driver. “Now, it’s a daily occurrence and always a drug overdose,” Gurcsik said. Programs are available for those struggling with addiction, such as recovery coaches who link individuals with trained mentors, through City of Angels, who assist the addict in seeking treatment and emotional support. Dalton said more than 200 people in Gloucester County have been connected with a recovery coach during the recent years. Michelle Perez, City of Angels and recovery advocate, said the way communities view and speak of addicts needs to change. Photographs of community members and loved ones lost to the opioid epidemic were placed along the edge of the auditorium stage during a candlelight vigil to be honored and remembered. This March, Mike Campeggio, a Washington Township High School 1997 graduate, celebrated three years of continuous sobriety after years of battling addiction to prescription painkillers and opiates, an experience that left the then-husband and father of two confused and alone. Class of 2008 graduate Amanda Vacca shared the story of her journey through addiction, one that left her in a car accident with seven of her friends, one who passed from the crash, in 2009. Vacca sustained a brain injury, and vowed to turn her life around, however the hold addiction had on her was too strong and she returned to drinking and using drugs. Vacca said at the vigil she felt embarrassed wherever she went in town, reminded of the accident but not knowing any way to cope other than using. Vacca attended a rehab program in Florida six years ago, followed by a move into a halfway house. It was then she realized she needed to do more. At this time, Vacca lives in South Philadelphia, runs a recovery house and just celebrated five years of sobriety in January. 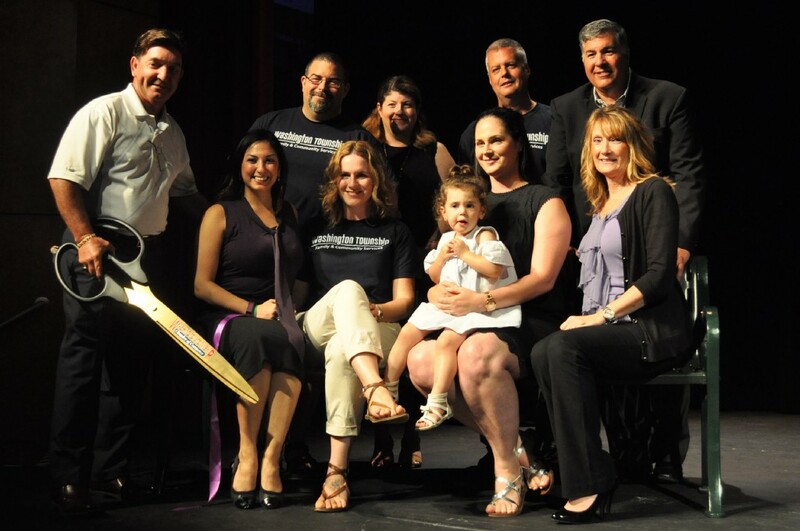 The themes of persistence, hope and community were shared through many additional speakers and their stories, including event organizer Julie Yankanich, Mayor Joann Gattinelli, Councilwoman Angela Donato, Superintendent Joseph Bollendorf, Municipal Alliance member Brooke Parker and Gloucester County Freeholder Dan Christy. All pledged to stand together with their communities to fight the epidemic, raise awareness and change the stigma on those who are experiencing addiction, or loss. For more resources and services within Gloucester County and the state, visit the ‘Addiction Services’ page at www.gloucestercountynj.gov.